I've decided to document the process! Let's find out together. To start, of course, I need to learn my current credit score. Yay! It's the same as reported by Credit Sesame. As of today, let's call my credit score 816. For added insight, Credit Journey provides a credit overview so that you can see the status of various factors that go into making up your credit score. Note: If you don't have a Chase credit card and don't want to use Credit Sesame, you can also get your free credit score from NerdWallet. The only catch? You have to create a NerdWallet account. What Happens If I Cancel a Credit Card? Perhaps most relevant for my current situation, however, Credit Journey allows you to simulate your credit score given a variety of changes. What happens if you take on a new loan? What happens if you cancel a card? What happens if you add a new credit card? What happens if one of your accounts goes to collections? With the Score Simulator, you can see how certain changes will affect your credit score. Unfortunately, this Score Simulator is a general-purpose tool. It doesn't let users exercise precise control over their input. So, for instance, I'm unable to model canceling my Chase British Airways card specifically. However, I'm able to model what happens if I cancel my oldest credit card. Because I cancelled all of my cards when I was digging out of debt in the early 2000s, my oldest card is a Capital One credit card that I acquired in 2007. That's not too far off from the British Airways card that I took out in 2011. Voila! I was instantly able to see that — according to this tool — canceling my BA card will, at most, ding my credit score by twenty points. The actual impact would probably be a little less. My current credit score is great. According to one score simulator, cancelling a card will have a minimal effect on my score. So, why am I still nervous? I'm not sure. To assuage my fears, I contacted credit expert Liz Weston, author of Your Credit Score. “Does cancelling a credit card hurt your credit score?” I asked, and I explained my situation. When scores are as high as yours, even a larger drop in points wouldn't affect you on a practical level. Once your scores are in the 760 range, you typically get the best rates and terms offered by lenders. Credit score simulators are just that – simulators. They can estimate what might happen to your score(s), but the reality can vary. The outcome of an action depends on various information in your credit report. Scores take into account the average age of your “trade lines,” or credit accounts, as well as the age of your oldest account. That's why you often see cautions against closing the oldest account. However, age of accounts is a fairly small part of your score, and the damage doesn't happen immediately, since the closed account will continue to be reported and its age factored into your scores. A bigger deal when closing accounts is your credit utilization. Shutting an account removes the available credit limit from the calculations, and that may have a bigger effect on your score. The credit score you're looking at can (and probably will) differ from the credit score(s) a lender may use, which means the impact could differ as well. The formulas for VantageScore and FICO in general aren't the same. Plus, they each have been updated (in FICO's case, multiple times) and lenders may use older versions or ones that have been tweaked for their industries, such as the FICO Auto Score 8 for auto loans. That's a fairly long answer to your quick question! In general, it's a good idea to avoid closing accounts when you're trying to build your scores or if you're in the market for a major loan. Once your scores are high, however, closing the occasional account shouldn't cause you undue worry. Weston brought up a point I hadn't considered: Canceling a credit card affects not only my age of accounts, but also my credit utilization. I have a $20,000 credit limit on that Chase BA card, so cancelling it will mean that I'm using a larger percentage of my available credit. That said, I don't actually carry any sort of credit balance. I pay my bills in full each month. As a result, my utilization should remain relatively low. Plus, if I do decide my score gets dinged too much, I'll take the Credit Sesame approach to building credit: I'll take out a new card, one without a fee. If I do choose to cancel my British Airways card, what's the process? Closing a credit card account is easy, but if you decide to do it, you should do it correctly. If you plan to close several accounts, do one at a time. When choosing which accounts to cancel, first eliminate cards that charge you fees. Cancel new cards before old cards. (Remember: the age of the account affects your credit score.) Consider keeping cards that offer good rewards programs. Before you cancel a credit card account, pay off the balance or transfer it elsewhere. Never attempt to cancel an account on which you still owe money. I've heard horror stories of banks raising interest rates on people who do this. Contact your credit card company. You might be able to cancel your account online, but most companies make this difficult (or impossible). You'll probably have to call. This so the sales rep can persuade you to keep the account open, of course. When this happens, remain firm. Take notes! Send written confirmation. After the call, use your notes to draft a follow-up letter like this one. Mail it to the card issuer. Check your credit report. After you receive confirmation that the card has been canceled, it may take several weeks for the change to be reflected in your credit report. It is your responsibility to verify that your report is accurate, so keep tabs on it. Like me, you may also want to monitor your credit score to see if there's any damage. Once you're certain the account is closed, cut up your credit card! Hurrah! If you have trouble with compulsive spending, it's best to cancel your accounts. Don't just cut them up, but cancel them. When I was having trouble with credit, I canceled my accounts, which bought me time to learn to manage money responsibly without an ever-present temptation to spend. In the end, this all seems worth it to me. If I cancel my British Airways card, my credit score drops from 816 to 796 but I save $75 per year. Because I have no plans to make any moves that rely on my credit score in the near future, this sounds like a smart move. I'm going to do it! There are 36 reader responses to "How to cancel a credit card (without killing your credit score)". This is such a timely article for me! It’s past time and my husband take a look at all our open accounts and make some moves. So many old “store” accounts that we signed up for to take advantage of a one-time 40% deal that I just don’t want open. We expect to finance a car in another year and three quarters (yes, I’m counting down) so I’m glad it shouldn’t impact things too much. Useful post, J.D. Closing a credit card account is a good idea, and you’ve given a great tutorial on its impact on the credit score. The use of credit cards today seems to be out of whack–it certainly costs a lot of people a lot of money! When I was 22, I learned about “how to use credit cards and build my credit” from an uncle who was a Wall Street Investment Manager. I will always be grateful to him for this life-lesson. At the time, my sole credit card was a Mobile Gas Card. He recommended I open an American express account. “I use it as an interest-free float” he said—in other words, just a 30-day loan. I followed his advice and set up my Amex bill to be automatically deducted from my checking account and I never paid interest (I never had a problem with spending however). I’ve been with Amex ever since (um, that would now be over 40 years), holding the green, gold or platinum card at various times (depending on how much traveling we are doing and whether the perks are worth the extra fees). We also hold VISA, since not every merchant takes Amex. The last time we bought a car, I wanted to rack up travel points, so I called Amex in advance to confirm that the large charge would be pre-approved. The car salesman was surprised and had never had anyone pay by credit card before (car dealers would MUCH rather you take out a “loan” with them and pay high interest for years–they make a huge profit on that). We resisted the sales pitch for the loan and instead took a big free trip on the resulting Amex points. We transferred money into the account to pay off the Amex bill that month. Done. We had put aside money in advance for the car, which we have done for all our purchases and this method saves us tons of interest over the years. We have treated our other credit accounts similarly–as a way to consolidate and simplify purchases. We wait until we have the money to buy what we want. Over the long haul, buying on credit (paying those horrific, wasteful interest charges) just burns a lot of your hard-earned money. The interest doesn’t seem like much, compared to the instant gratification of getting the thing you want, but it adds up over the years. You may as well just light a match and hold your cash over the flame. Credit card and car payment charges keep a lot of folks from ever accumulating wealth—which is such a shame! I love your idea about paying for a car with a credit card. When I wrote about the fact that Kim and I will probably need to buy a car soon, one reader emailed to suggest exactly this idea. They’ve done it. Their mother has done it. They know others who have done it. Car dealers don’t like it but if they accept credit cards, they pretty much have to do it. Nice way to rack up rewards! I would have been happy to use a credit card on the last two cars I bought (used), but they limited me each time to ~$1,500 on the card. I don’t think they ever really gave me a reason, and I didn’t push it much, but it would have been nice to get those rewards…. They are charged for the CC transaction. J.D. – By your own admission, since you are not using your credit for anything, close the BA account to save the $75. But, at the same time, I would absolutely also sign up for the Chase Freedom Unlimited to pair with your CSR. It’s no annual fee, earns a flat 1.5x rewards and can pool points with the CSR. I can’t remember what your monthly spending from the past couple of posts was, but I do remember that it wasn’t all travel and dining, so transferring that spending from the CSR to the CFU immediately earns more rewards points…and who doesn’t want more free money? Another point about the utilization – you mention always paying your bill in full, which is fine, but the score will go up and down based on the posted monthly statement amount alone. As such, if you have a big spending month where your statement is over 10% of your limits/available credit, the score will fluctuate. That is my guess on what happened on your July and Nov dips. I think you’re absolutely right about the utilization fluctuations causing my credit score to fluctuate. I wrote this article in early February. The numbers are from early February. (Long story about why it had to be delayed from early February to late March.) Today, my credit score is actually 798 !!!! Why? The only thing that’s changed is my credit utilization, so that has to be the factor. I’ll be sure to ask about opening the Chase Freedom Unlimited when I close the account. Thanks for the suggestion. I’m pleased with the Chase interface, the Chase points, and Chase customer service. Happy to keep giving them my business. One more “free money” follow-up: the current sign-up bonus for the CFU is $150 cash back if you spend $500 in the first three months, but this would only be true for a new opening for the CFU. If the Chase reps ask “do you just want to change the card from BA to CFU and not do a hard credit pull”, the sign-up bonus would not apply. First, you should call the company and ask to change to a different card with no annual fee. Most cards have a no annual fee version. Then you won’t need to cancel it and it won’t change your credit score. Of course, canceling it is a good option too. You won’t have to worry about it anymore. This was my thinking as well. It’s amazing how many cards can exist in the same card family. I only cancel if I actually dont like the company (usually their customer service). I went to “like” your comment, Joe, but then realized I’m not on Facebook. Might be time to find a plug-in that allows folks to like comments haha. I know that I used to have that back in 2008 and 2009. I agree with this suggestion. Another option is to move the available credit on your BA card to your Chase Sapphire Reserve and then cancel BA. This will keep your overall credit number. Given that every company calculate credit scores differently, and the likes of ‘Credit Sesame’ are in the business of selling credit scores (or using credit scores to sell other things) – are you not placing undue importance on the numbers they give you rather than, say, the companies who are actually going to provide you credit and will calculate their own score for you, given that they’re likely to score differently for different things? J.D., rather than open a new credit card to lower your credit utilization ratio, you can call the companies whose cards you still carry and ask to have your credit limits increased. This will bump up your available credit, resulting in a lower credit utilization ratio. It will also avoid a temporary dip in your score for opening a new account and the hassle of managing new accounts. Doing so will usually require a hard pull…which all things equal, one additional hard pull will not be as negative a hit as the change in accounts age/number of accounts, but there is still a hit. I have a great credit score and pay all my balances off in full each month. However, if I spend more one month, say for a vacation, my score is dinged for a month or two. Why does this happen? Why should it matter how much I spend in one month? Thanks. It sounds like you’re experiencing the same thing I am. When you spend a lot at any given time, you’re using more of your available credit. This increases your “credit utilization”, which lowers your score until the utilization returns to normal. Does that make sense? I’ve been a huge fan of this blog for many years and this is the first time I’ve come across an article where I feel like I can contribute some helpful comments. Maximizing credit card rewards and credit score impact is kinda my “thing”. 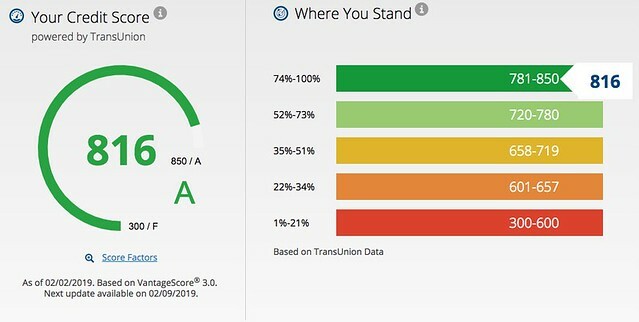 First, I’d like to inform you that both Credit Sesame and Chase Credit Journey do not report your FICO score — they show you a VantageScore, which is not the same score. FICO is the gold standard credit score used when about 90% of credit decisions are made. I’d be happy to help explain the tangled web of credit scores but don’t want to take up too much space here in the comment section. Second, as someone else mentioned, I’d recommend doing what’s called a “product change” to a no-fee version of the card. There’s an unpublished no-fee version of the Chase British Airways Card that earns 1 Avios for every $2 spent and you can’t spend your way to the companion ticket like you can with the version you currently have. A 5-10 minute call to Chase can help you avoid a big hit to your credit history, even if you only keep that card in your sock drawer. Additionally, I’ll also recommend that if you do call saying you want to cancel your card, you may be offered a retention bonus. The offer may be something like “spend $2,000 in the next 3 months and you’ll earn 8,000 Avios”. You’ll have to decide if the annual fee is worth the extra miles to keep the card, and that’s only if you have an offer available. Either way, you always have the no-fee product change option. Last, if you do decide to cancel the card, Chase allows you to transfer the available credit limit from one personal card to another, which would further reduce the negative credit score impact. I’d be happy to share more on one of my favorite topics. Between my wife and I, we have added and canceled over 100 credit cards over the last 10-15 years. In our case, getting rid of a card has had little to no effect on our scores which have ranged from 790 to 820 over the years. We’re down to 2 credit cards each now, but will probably start back playing the credit card game in a year or so. I’d say we’ve averaged $5k-$10K in hotel/air saving per year doing this, but it’s getting harder. I’m surprised you’ve been throwing away $75 a year just because you were worried about your credit score. Even if you are planning to finance something soon, it’s unlikely the increase in interest rate (because of the decrease in credit score) would come anywhere near $75 a year. I had too many open credit cards and finally decided to just canceled a couple cards and significantly decreased the limits on a handful of other ones. My credit score dipped for a few months then went back up; not a big deal. I don’t pay the bank. The bank pays me. IOW, no-fee rewards cards only, 30-day float, our “bank” is a credit union. With one exception: DH’s AmEx that earns Delta Skymiles and gets each of us a free bag check (Detroit is a Delta hub). Something to consider when you have multiple cards from the same provider…ie in this case Chase. I recently cancelled a credit card with Chase – you mention that you also carry the CSR, another Chase card. In a similar scenario I also had another chase card at the time. The service rep on the phone kindly (and smartly) offered to transfer the credit limit over to the other remaining Chase card, so there would be no impact on my credit score given the credit utilization ratio would not change that way. I have been reading the comments and one thing keeps me shaking my head. The thought process that constantly buying things on credit every month is earning points for some reward. Your fico score is so important in life, Really? The best credit score would be zero, this means you always pay in cash and you actually own everything you buy. Most of you think this is impossible, not so, it’s called discipline. So yea, it’s OK to have a credit card to make reservations, online purchases etc. This is OK if you can discipline yourself, but the credit card companies are betting against you and they are right! Many years ago in my early 20’s, I fell into this trap, realized debt was about the worst thing in life and made a plan. So my plan was to use only cash, best decision I ever made. I can’t even count how much money I saved on purchases by using cash. Now years later while my ex coworkers are still working and are in debt, I was able to retire at 52 with a fully funded retirement plan and every thing I own paid for (that includes my home , property and 22 vehicles). So go ahead stay in debt and remain a slave. It’s your decision. Most people here pay off their balances every month. But I object to your use of the word “slave”. Slavery is a horrible thing. And I think the tendency to talk about “wage slavery” or “debt slavery” is only true if you acknowledge that if you are the slave, you are also the master. Debt and employment are byproducts of a person’s choices. I dont mind the psychological perspective of an individual as both slave and master. But that isnt how it’s used. We are NOT slaves of our employers and/or of our banking institutions. I think it is wrongheaded and destructive to think so both personally and to society at large. Wally, you’re right that most people with credit cards carry a balance. When I went into the bank to get my Chase Sapphire Reserve (I had to go in person in order to the sign-up bonus), the guy who helped me told me that 95% of their customers with cards are in debt. I’m not one of them. Many folks here aren’t. And I’m very careful to note that if you are somebody who can’t (or won’t) pay off debt, you shouldn’t have cards. It’s possible to use credit cards without going into debt. It’s just not common. Mr. Roth, as much as I value your insights on this subject, I disagree. Financial statistics reveal most American families are deeply in debt and living paycheck to paycheck, however they have newer homes, newer cars and accept being deeply in debt. So, they are financial slaves. If either parents ever lost their job they would quickly lose everything. This mind set is not acceptable. I blame our liberal school systems that does not teach any money management skills. I also blame parents, kids emulate their parents who seem to have a “live for today” attitude rather than actually planning for the future. Granted this is not a total picture of society, however we would have to agree it is a large percentage. Just my opinion, your mileage may vary…. Q: How many Americans 50 years of age have saved anything for retirement? The answer should concern everyone…. I think you should read JD’s response again. Can’t argue with someone who drank the Dave Ramsey Kool-Aid and can’t entertain another point of view. While notionally, yes, not having any temptation or history of credit sounds great, but as many an article will tell you, credit score is used for more than interest rates – they are touching rent/lease applications, job applications, insurance rates, i.e. things being cash only doesn’t let you avoid. Ah, job applications–no. Employers hiring people for positions that involve security clearances etc do not use your credit SCORE. They might look at your credit HISTORY to see if you’re prone to making bad decisions or defaulting on your promises, i.e., if you’re trustworthy or not. But if you own all your assets outright, don’t owe anybody, and have no history of defaulting, then you’re not a theft or fraud risk. It is better to just call the credit card company and see if you can lower the credit card to no annual fee one. It is pretty easy to do and they will want to keep you a customer. You may lose some perks with the card but will save you from cancelling. Then just put the card away somewhere or cut it up and don’t worry about. As someone who lives in Finland, I don’t get this whole credit score system. What’s the purpose of it, and what is your score used for? Is it when they evaluate if you should be eligible for another credit card by a different company, for consumer loans or for long-term loans like for your house? We don’t have that system, eg. my Amex is based on how much I roughly earn per year. If you default on the payments they cancel your card and place the amount owed into collection. If it goes into judicial collection you won’t be eligible for any credit cards until the amount is collected and for (i think) 5 years affter. So this score-thing seems extremely confusing. In the U.S., your credit score and history is used to see if you quality for a loan (like for a car or house) or credit card or such, what rate you will pay, and sometimes even if you will be approved to rent an apartment (they want someone who has a history of paying on time), or offered a job (they want someone who is responsible). Creditors do typically also take your income into account, but less so for credit card companies (mine keeps raising my limits and combined they are now nearly at my yearly income). Thank you so much for taking the time to explain, Kate! So basically you _have_ to use a credit card to be able to rent or buy a house? I realize it’s not this simple, but to me that seems like a system that’s built on pushing people to (over)use credit. Over here you typically have to save 10-15% of the price of the house you want to buy, and have a steady income to qualify for a loan. The other route is to have a guarantor (+stedy income) for at least that amount. Typically for first home-buyers that would be their parents and from there on they’ve repaid their loan so much that they can use that value when they buy their next home in X years. Then the bank also calculates your ability to pay on based on your salary, and they just don’t loan you a ridiculously excessive amount (even if they might give you quite a lot compared to what you earn). The entire system seems to have a different basis in the US, and looking from here it seems to have a lot of pitfalls where you can really easily get into trouble. It doesn’t seem too user friendly and to be honest, seems like a rip-off.